The Devil's in the Details | Belle | Style Weekly - Richmond, VA local news, arts, and events. Scrambled, fried, poached, hard-boiled, basted and even baked are most of the ways I love my eggs. I've been told I have a near obsession with eggs (or maybe it's a fixation? ), and it's hard to deny. A few years ago, when egg consumption was equated with an instant heart attack, I used to eat them on the sly. Once the doctors came around to the other side of the issue -- even going so far as to allow all of us to eat an egg a day without the threat of imminent death  I ate them proudly, maxing out my seven a week around Thursday. There are good eggs and bad eggs, however. Bad eggs are generally the kind you find in the grocery store in the dairy case. They're white (unless specified otherwise), kind of old, with seeping albumen, and their yolks are a pale, anemic-looking yellow. They're fine, they're OK  if you haven't tried eggs while visiting Europe. The eggs on the other side of the ocean have vibrantly orange yolks verging on red (particularly if you're out of the city), and the flavor will taste of nothing less than the sunshine and country air. Actually, they'll taste just like eggs, only more emphatically, deliciously eggy. That's because the chickens will have led truly free-range lives  be careful driving  eating different plants, worms and bugs, and maybe the odd seed, thus pumping up the xanthophylls, or yellow pigments, in the yolk. I haven't found these kinds of eggs here, but I have found fantastically fresh, wonderful-tasting eggs at the 17th Street Farmers' Market. Of course, the market doesn't run all year long, and when my favorite vendor stopped selling there, I had to get into my car and drive out to Goochland County to Brookview Farm. At the time I'm writing this, Brookview's supply hasn't always kept up with demand, although it promises to have lots of new chickens busy laying eggs soon. In the meantime, I'm not always up for a long drive first thing Saturday morning just so I can stare down that guy in the SUV who's brazenly trying to get away with buying more than his fair share of eggs. I've considered discreetly keeping a few chickens in my backyard. That, frankly, is a fantasy my husband has been unable to completely discourage, but I haven't really been able to nail down the details yet. Until then, I've had to satisfy myself with eggs from a small cooperative of organic farms marketed under the label Shenandoah Valley Family Farms and carried by Ellwood Thompson's and Good Foods Grocery. Fresh, kind of local and a lovely yellow. They'll have to do for now. Hard-boil eggs (I wouldn't even presume to tell you how to do this  everyone is convinced his or her way is best). After chilling, peel and slice them in half. Plunk the yolks in a medium bowl and mash thoroughly with a fork. Add mayonnaise, Dijon mustard and wasabi. Stir. Season with salt and pepper to taste and fill whites with yolk mixture. 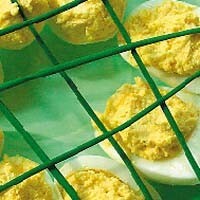 Serve proudly and refrain from mentioning your little variation on the traditional deviled egg.